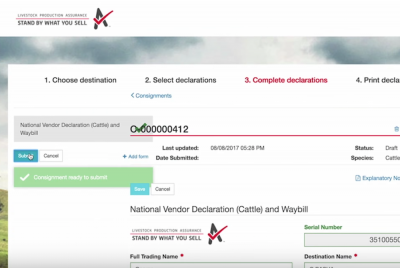 MORE than a year after electronic National Vendor Declarations (eNVDs) were launched the most producers are yet to try the paperless NVD option. Screenshot of an eNVD page from an LPA YouTube video. 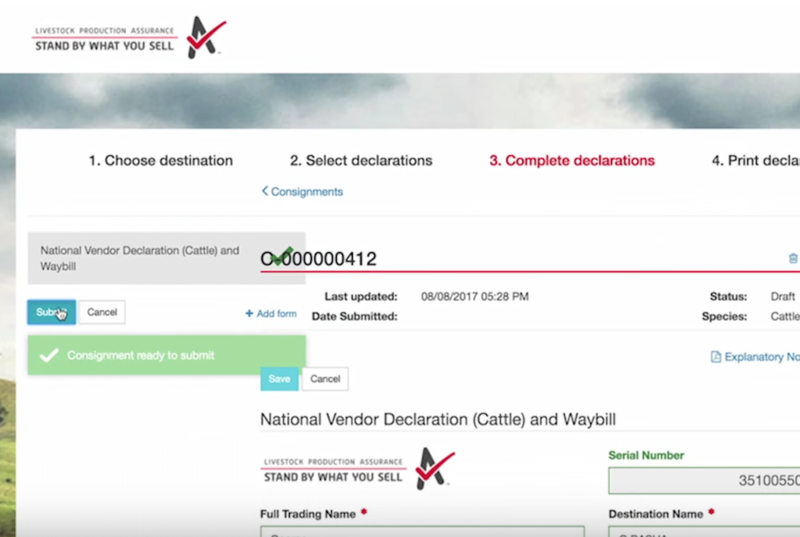 MLA’s Integrity Services Company launched eNVDs in August 2017 to allow producers to submit declarations about the food safety status of their cattle more quickly and efficiently, and to reduce NVD non-compliance rates. Unlike traditional paper-based NVDs which cost of $40 per book, or 95 cents per ‘eDec’ (the online printable version of the traditional NVD), eNVDs are free for LPA-accredited producers to use (As of August 2017 producers pay a three-yearly fee of $60 plus GST to maintain LPA accreditation). Producers can access eNVDs through the LPA service centre website or through one of the various subscription-based livestock management software products and apps that now incorporate eNVDs, including AgLive, Maia Technology or Agriwebb. Several agents and processors contacted by Beef Central in recent weeks have reported that the rate of take-up of eNVDs has been very slow since they were launched 12 months ago. Official usage statistics provided to Beef Central from MLA’s Integrity Services Company indicates that 13 percent of livestock consignments transacted since August 2017 accompanied by an eNVD. Cattle sold with traditional paper based NVDs according to the ISC in the past 12 months accounted for 56pc of total sales, while ‘eDec’s accounted for 31pc. The biggest users of eNVDs and eDecs according to the ISC are feedlots. As a concept eNVDs make sense – they allow information to be transferred faster and more conveniently and with more checks in place to improve accuracy and compliance rates – so what is holding adoption rates back? One view offered was that eNVDs in their current form aren’t yet entirely compatible with prevailing business rules and the practical realities of selling cattle. One livestock agent explained that police in some states will accept eNVDs while police in other states will not. A processor said several people in his company need to see hard copies of each NVD for administration purposes, so traditional NVDs were still used. In some cases the eNVDs being accessed were still being used in the same was as traditional NVDs: “We see people going on and accessing and then printing them out and filling them out, but not electronically sending them,” Elders’ Paul Holm said. Lack of connectivity is also an issue. eNVDs are designed for use offline, with submitted information uploading to the NLIS database as soon as the device comes back within a network signal. In many cases a device used to upload eNVD data at the yards when cattle are transported will return to a signal, at the homestead for example, and will automatically upload eNVD data to the database before the truck has reached its destination. However may producers experience connectivity problems and a lack of trust in the new electronic version over the traditional paper-based version remains a key point of resistance. Integrity Systems Company Program Manager Damon Holmes said the premise of introducing electronic NVDs was to make the data entry and transfer process easier and more efficient for all supply chain stakeholders. He said eNVDs were a work in progress, and it was never the expectation that that a solution could be rolled out and immediately fit the needs of needs of each sector of the supply chain. He said the ISC continues to work with each sector – producers, lot feeders, saleyards, agents, transporters and processors – to identify and resolve issues around functionality and connectivity that are currently limiting the uptake of eNVDs. “Our approach is to make it as simple as possible, while ensuring they comply with program rules and standards,” Mr Holmes said. Mr Holmes said the ISC is also looking at the role QR codes could play in allowing further points along the chain to access data inputted into eNVDs where connectivity is a problem. In feedback to Beef Central processors said eNVDs should include a mandatory check process to prevent them from being sent if any question has not been answered. “A mandatory check box where the form won’t let you go to the next part if it is blank would alleviate a lot of the problems we see with NVDs,” one processor commented. Another processor said of eNVDs: “we just want it to happen”. “I think the electronic NVDs will take a lot of the current problems out and we would get them a lot earlier,” he said. Some processors said more awareness campaigns were needed to promote greater uptake of eNVDs. I used the Aglive Pro app to send an eNVD and it was a poor experience. Badly designed app, and I had to call the help desk and they did not know how to solve the problem I was encountering. Won’t every try to use again. Have been using eNVD’s and the predecessor for years. My only complaint is that the hotline for problems is only manned during week days which isn’t any help if your trucking cattle over a weekend and have a problem with the system. Agree with Sandi, the online forms are poorly designed, if your internet service is slow it takes for ever. Also if your NVD doesn’t print first time (printer problem, internet service etc).when you reprint the form it says ‘duplicate’ on it and guess what most abattoirs will not accept it. WHY???? Yep – Filling the online form is way slower than paper. Pretty cheeky to use the phrase “free eNVDs for LPA accredited producers’ when you have to pay a 3 yearly fee (it’s not “free”). Non-compliance is largely due to poor internet service. Filling out paper NVD is up to a hundred times quicker than filling it out online. As beef producers, we still use the paper version. Question – what happens to a truck carrying stock to either market or the abattoir or to a client if the Stock Squad stop the truck and wants to see verification of the stock on board by way of a paper NVD and it’s all been done on line? Or do I still have to print off a couple of copies for the buyer and the truck driver?